I love baking with lemon. And I love lemon cookies. I was in girl scouts when I was younger and I hated selling the cookies (I was always shy and hated going door-to-door selling anything). But I loved getting to buy and eat them! My absolute favorite – especially since they’re discontinued now and I find myself craving them (*sadface*)- were the Lemon Pastry Cremes. Oh they were so good! Zingy lemon filling between two crispy, airy ‘pastry’ cookies. Soooo good! The rest of the cookies pale in comparison. It may be a little more time intensive to roll each cookie, cover with parchment paper, and flatten with the bottom of a glass, but it works well for me. As I’ve done this with other recipes before, and it’s even listed in this recipe as an ‘alternate’ to rolling, I don’t feel so bad about this. It works well and I find it maybe a little easier to control the thickness of each cookie – so they all bake evenly. 1. 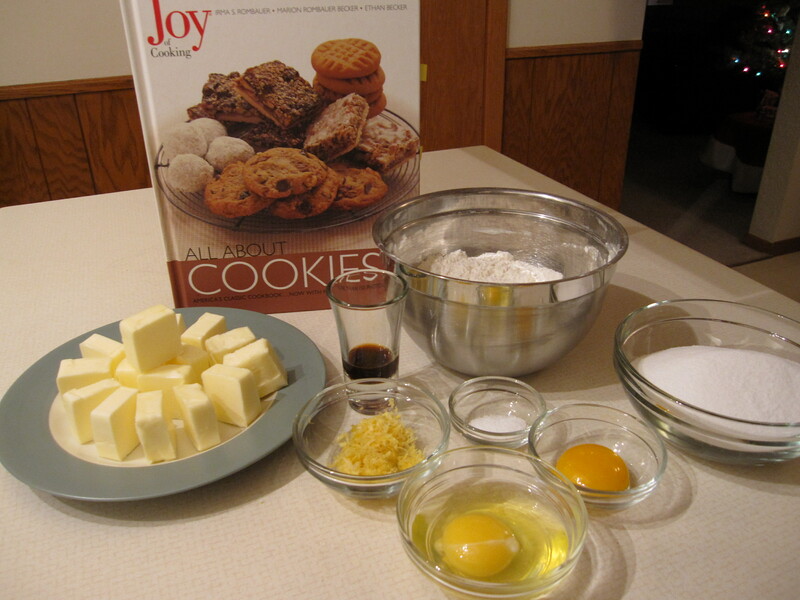 Make sure all your ingredients are at room temperature (specifically, the butter and eggs) before you start. This recipe needs to rest for at least an hour before rolling the dough. I usually make it the night before and let it sit overnight. 2. Beat the butter, sugar, and salt in the bowl of a stand mixer until fluffy, light, and well blended. 3. Add the egg yoke and beat until well blended. Add the whole egg and vanilla and beat well. 4. Reduce the speed to low and mix in the flour until just combined. Don’t over-mix the dough. 5. Place two large pieces of plastic wrap or wax paper on the counter; divide the dough evenly between the sheets. 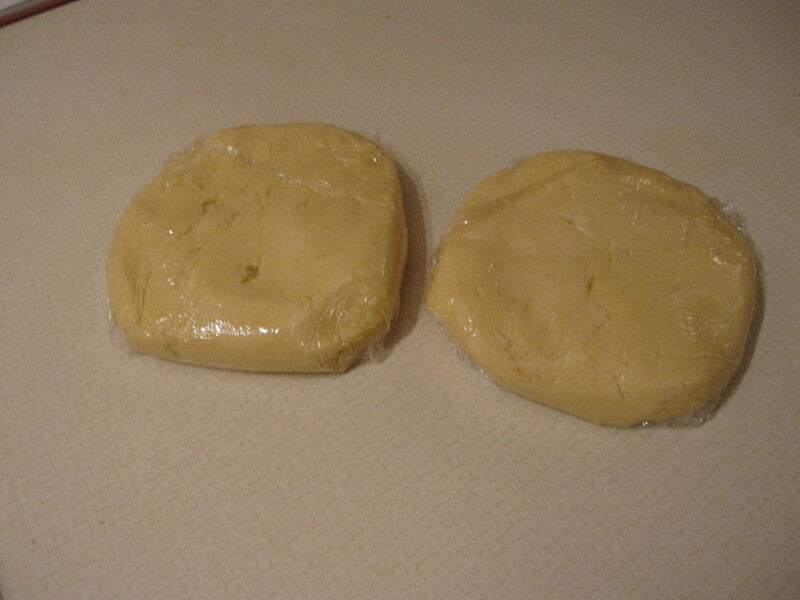 Flatten the dough and form a disc shape of each, covering completely in plastic wrap. Refrigerate until firm, at least an hour, or overnight. 6. Preheat the oven to 350° and make sure one of your oven rack is in the top 1/3 of the oven. Cover 2 baking sheets with parchment paper or grease well. 7. Work with 1/4 of the dough at a time (half of one disc), leaving the rest in the refrigerator. Roll teaspoon-sized balls and place them on the cookie sheet, about 2 inches apart. Using another piece of parchment, cover the dough balls loosely and press down evenly and slowly on the dough. 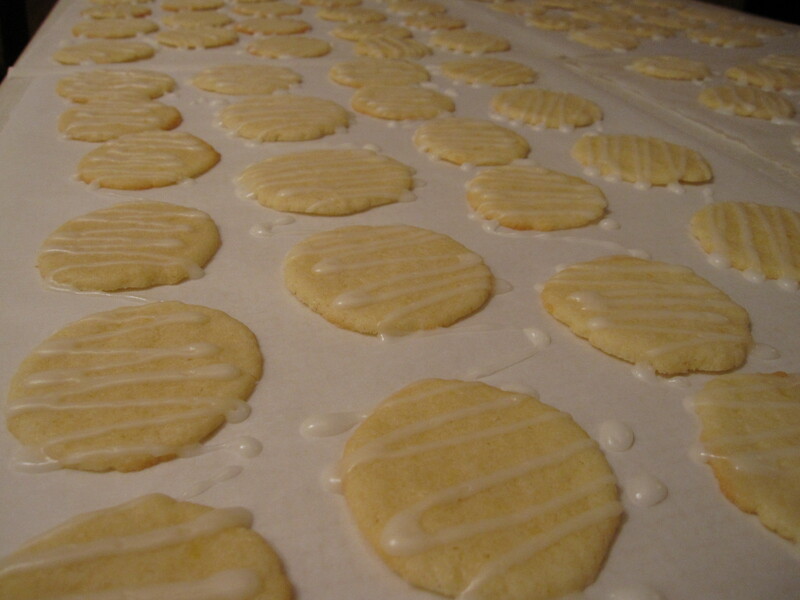 You want the cookies to be about 1/8″ thick, but any thinner and they will stick to the parchment paper. (You can also roll the dough to about 1/8 inch thick, sprinkling the dough lightly with flour to prevent sticking, as necessary. 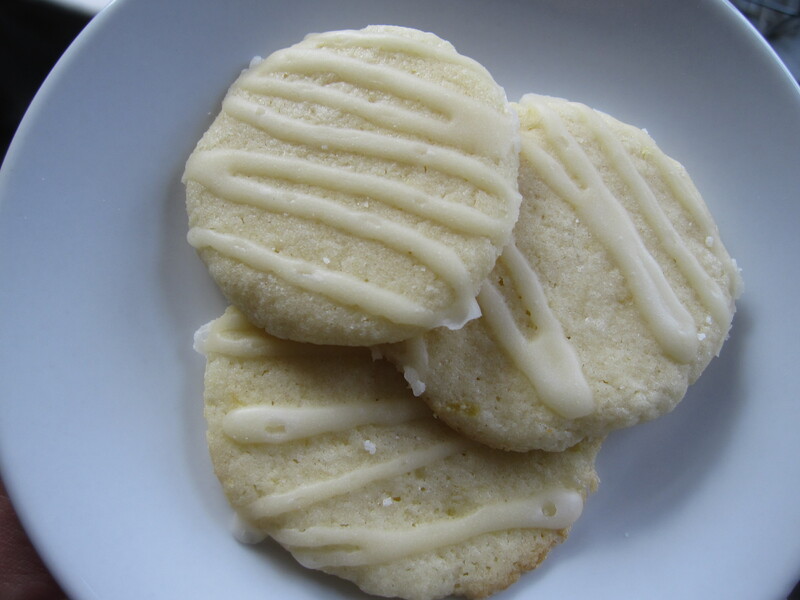 Cut using ~ 2 – 2 1/2″ cookie cutters, loosening with a fine-edged spatula if necessary). 8. Bake for about 6 – 7 minutes, or until just faintly golden. The cookies will quickly go from golden to brown. This will change the flavor and they’re better when the cookies are lighter in color. 9. Immediately transfer the cookies to racks to cool. I like to grab kitty-corner edges of the parchment paper and gently transfer the whole batch to a cooling rack. I find this helps to avoid broken, smooshed, etc. cookies as they’re not quite firm when they’re just out of the oven. 10. Once the cookies are cooled, mix the powdered sugar and lemon juice together until the icing is a spreading/piping consistency. I like my icing a little thicker; add more sugar or lemon juice depending on how thick/thin you want the icing. Using a zip-top bag (probably a quart or gallon sized), fill about halfway with the icing (any more and it may push over the top of the bag and spill out), close the bag and gather the icing into one corner, twist the top of the bag a little to keep the icing in the bottom corner. Carefully snip of a tiny corner of the bag and decorate cookies however you want. Or, use a spatula or knife to spread the icing evenly over the top. I like using a disposable pastry bag and a teeny-tiny piping tip as it’s less likely to spew all over the place like a bag will sometimes. If you make these, I hope you enjoy them. I find these cookies to be a nice, refreshing alternative to some of the heavy, dense cookies you find on cookie trays this time of year. 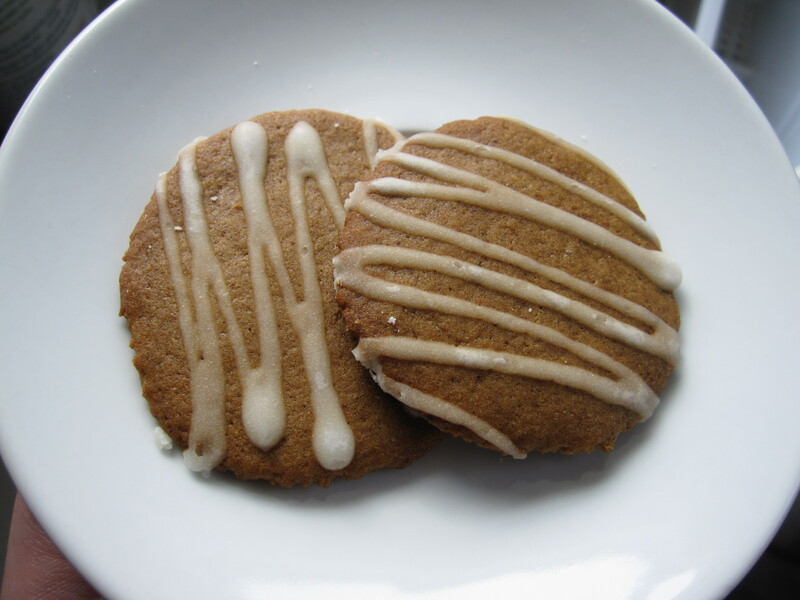 Oh, and I had leftover Pepparkakor and leftover lemon icing, so I combined them… the flavor is wonderful as well!